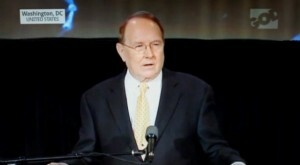 Dobson, 78, made his remarks during his speech in Washington, D.C. at Thursday’s annual National Day of Prayer event. He read a letter that he had circulated to his supporters as to why he chose to buck the system and fight the requirement in court. Dobson’s remarks were met with a standing ovation and cheers from those in the audience. The longtime radio host had just been granted a temporary injunction against the mandate last month, obtaining a reprieve while his case moves forward in court. Attorneys for Alliance Defending Freedom (ADF) had argued that the requirement was a violation of Dobson’s religious liberties. Dobson, who has 28 employees on staff, told those gathered on Thursday that the government fine surrounding Obamacare would have indeed shut down his ministry. Focus on the Family is one of over 100 ministries and religious organizations that have challenged the mandate in federal court. The United States Supreme Court is expected to issue its ruling next month surrounding Hobby Lobby’s fight against Obamacare. The decision will likely have far-reaching effects for religious-owned businesses nationwide.